Posted in Advice from Lama Zopa Rinpoche, Lama Zopa Rinpoche News and Advice. 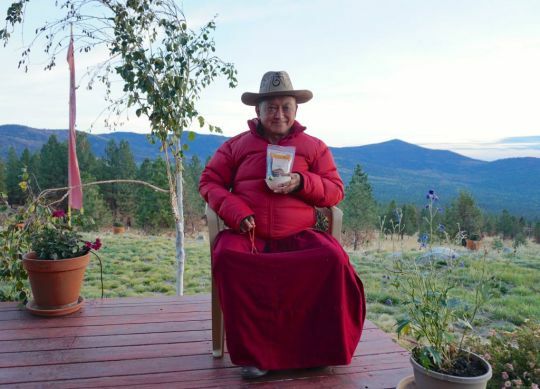 Lama Zopa Rinpoche wearing his mantra hat and holding tea offered to him by Kunsang Yeshe Retreat Centre in the Blue Mountains of Australia. Washington State, USA. November 2016. Photo by Ven. Lobsang Sherab. Lama Zopa Rinpoche was offered tea recently by Kunsang Yeshe Retreat Centre in Australia, which was selling the tea as a fundraiser. He responded with the following advice on how to “really” bless the tea. Thank you so much for the tea you offered. I have been thinking about the tea. Many different centers only survive by donations, but in the past I did think about whether there could be a small business of selling tea that could help generate support for centers. At that time I was told that the outer packaging is also important. For example, tea packaged in the Japanese way looks very expensive. I was told that the packaging is important. So thank you very much, I enjoyed the tea. I thought that even without milk this tea would be very good. 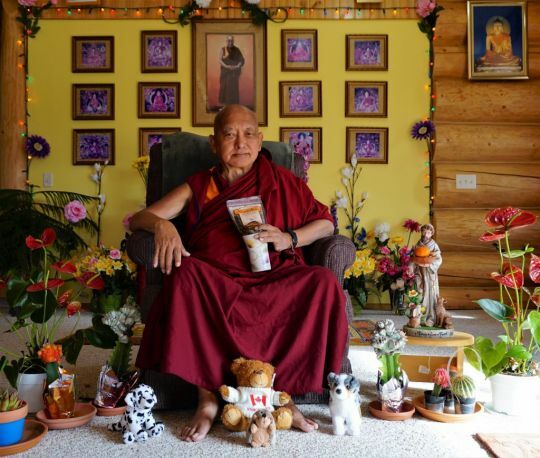 When I was thinking about the tea business in the past, I had the thought that I would request Khensur Denma Lochö Rinpoche, a very high Lama in Dharamsala, to bless 100 packets of tea. I thought that with Rinpoche’s prayers on the tea it could really benefit people. But Rinpoche passed away. Anyway, regarding the tea you are producing, this is how I suggest to bless it. It would be so good if the tea could be blessed by a group of Sangha, or can just be one or two Sangha. The first day of the blessing could be a Medicine Buddha puja at the center. It would be so good to bless the tea for one week before it is sold. That way many prayers can be done on the tea. So to do seven days of strong prayers could have a lot of effect and bring benefit to the mind and not only the body. That would help a lot of people, especially those who drink with faith, but generally anyone who drinks it. To specifically pray to Medicine Buddha: For anyone who drinks this tea, may it help heal all depression, all those with physical sicknesses and mental sicknesses, cancer, diabetes, and curable and incurable sicknesses of the mind and body. May anybody who drinks this tea be healed immediately. Then for anyone who drinks the tea, pray for them to be able to correctly follow the virtuous friend, to have all the realizations up to enlightenment, omniscient mind, and especially to develop loving kindness, compassion, and bodhichitta. For anyone who drinks the tea, may it totally change their mind from harming others to cherishing and benefitting others. So this is for the Sangha to know, how to pray and to make strong prayers. And not only Sangha but anyone who blesses the tea. Best would be to start with the extensive Medicine Buddha puja, this is very long and extensive so may not be possible, but you can keep in mind any time the center does do the extensive Medicine Buddha puja to bless the tea at the same time. So if not the extensive Medicine Buddha puja, then, to start with, do the middle-length Medicine Buddha puja (this is the normal Medicine Buddha puja that is done in the centers) and make strong prayers to Medicine Buddha to bless the tea as mentioned above. Then for the following six days you can either do the mid-length Medicine Buddha puja each day to bless the tea, OR you can do the Medicine Buddha Sadhana (that is a shorter practice, but it contains the recitation of the seven Medicine Buddha names) OR if there is only a short amount of time, then you can do the “Blessing Medicine” prayer that I have put together. Lama Zopa Rinpoche surrounded by “friends”, holding tea offered by Kunsang Yeshe Retreat Centre in Australia. Washington State, USA, November 2016. Photo by Ven. Lobsang Sherab. Transcribed by Ven. Holly Ansett, Buddha Amitabha Pure Land, Washington, USA, October, 2016. Edited by Mandala for inclusion on FPMT.org. Get copies of the Medicine Buddha pujas and prayers recommended by Lama Zopa Rinpoche from the Foundation Store. Lama Zopa Rinpoche is the spiritual director of the Foundation for the Preservation of Mahayana Tradition (FPMT), a Tibetan Buddhist organization dedicated to the transmission of the Mahayana Buddhist tradition and values worldwide through teaching, meditation and community service. Learn more about Lama Zopa Rinpoche, spiritual director of the Foundation for the Preservation of Mahayana Tradition (FPMT), and Rinpoche’s vision for a better world. Sign up to receive news and updates. If your path teaches you to act and exert yourself correctly and leads to spiritual realizations such as love, compassion and wisdom then obviously it’s worthwhile.